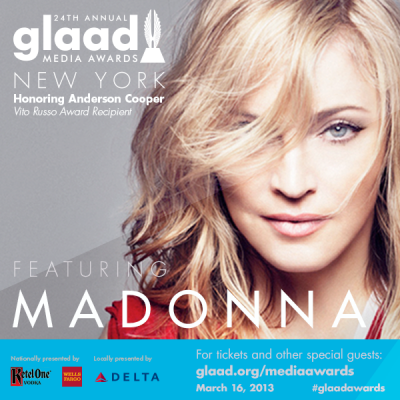 Madonna will will appear with journalist, author and talk show host Anderson Cooper on March 16 at the 24th Annual GLAAD Media Awards in New York, presented nationally by Ketel One Vodka and Wells Fargo, GLAAD announced today. She will present Anderson Cooper with the Vito Russo Award, which is given to an openly gay or lesbian member of the media community for their outstanding contribution in combating homophobia. The Associated Press broke the story. NEW YORK (AP) — Gay advocacy group GLAAD says Madonna will present CNN’s Anderson Cooper with an award for openly gay media professionals. All guests enjoy silent auction, live auction, dinner, awards ceremony and after party.